The crape myrtle trees in Wolmyeongdong used to be located in front of a tomb. The tomb was moved to the foot of the mountain on the way into the village from a wide road near Boryeong Dam (see note below). Note: The government designated Boryeong Dam as a place for floods. 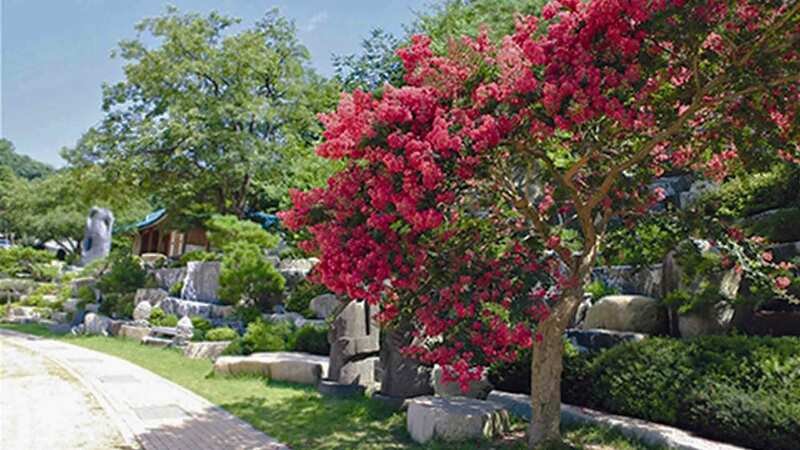 The crape myrtle tree is a tree native to China and Korea. It grows in almost any kind of soil, sand, loam, or clay. Most trees blossom in the spring and grow thick green leaves in the summer. However, there is a tree that blossoms in the middle of the summer and stays fully bloomed for 100 days. That is the crape myrtle tree. One day Pastor Jung Myung Seok asked one of the workers to buy all the trees in the construction area around Boryeong Dam. When the worker went there, he found two huge crape myrtles beside a tomb in the mountains. They were both about 200 years old. Since the crape myrtles were growing between rocks, they thought it was going to be difficult to excavate the trees. Many people before had given up on taking the trees and left empty handed. Trees such as these would be worth about $10,000 per tree. Nevertheless because the rocks around the trees were connected to the rock below the tree’s roots, it seemed impossible to dig out the trees. Everyone thought that it was impossible. So they turned their backs on the idea, saying that it was like a pie in the sky. The trees were beautiful, but they were so hard to dig out because of the rocks. When the Wolmyeongdong workers reported about the situation, Pastor Jung said, “Don’t give up. Try to break the rocks and dig out the trees.” After saying that, he made a contract with the owner of the trees. He told the owner that it would be difficult to dig out the trees because of the environment. So the owner agreed to sell each tree for $350, $700 total for both trees. Since we bought the trees, the workers decided to try excavating the tree. That day, they were able to work easily on the first tree because the rocks underneath its roots were not connected to the rocks that were around the tree. On the other hand, the second tree’s roots were. But they were able to break the rocks with hammers because the rocks were thin. Instead of thinking like the others, that the task was impossible, ultimately they were able to break all the rocks and dig out the trees. They bought two trees worth $10,000 each for just $700. The Lord spoke through Pastor Jung so that someone would go to the construction area at Boryeong Dam and find these two grand masterpiece trees. The owner of the two trees thought that it was a waste for them to be around a tomb. But he did not attempt to dig them out since he thought the trees roots were tangled within the rocks. Seeing with your eyes is not enough, you have to take action and then see. With the money Pastor Jung received from his mother he planted the crape myrtle trees. He bought the two crape myrtle trees and planted one besides the traditional Korean blue-tiled roof house. He set the other one near the Only the Lord God Rock.